This adjustable mandoline is so light and easy to use that it can be an everyday tool. I used it for slicing paper thin red onions for this salad. I prefer to serve salad in a large shallow bowl so the ingredients remain more evenly distributed. This is so convenient. Measure, mix, store, and pour from this one container. Roasted sweet potatoes, apples, cranberries, candied pecans and greens make this healthy, tasty combo ideal for Thanksgiving and holiday menus. Using a large shallow serving bowl or platter, layer ingredients starting with greens on the bottom. Then evenly distribute remaining ingredients over top of greens: red onions, apple slices, cranberries, cheese crumbles, and pecans. 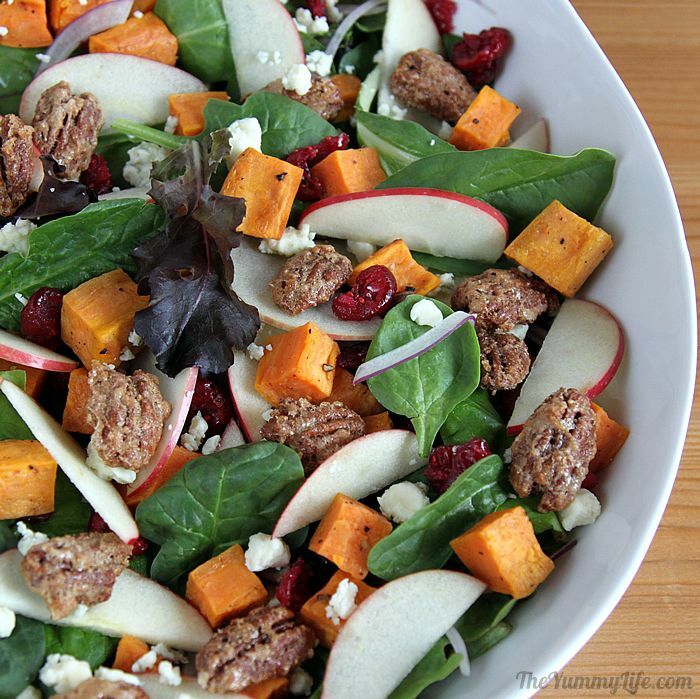 To keep ingredients evenly distributed, do not toss salad. Use tongs to transfer salad portions to individual plates. Drizzle with vinaigrette. 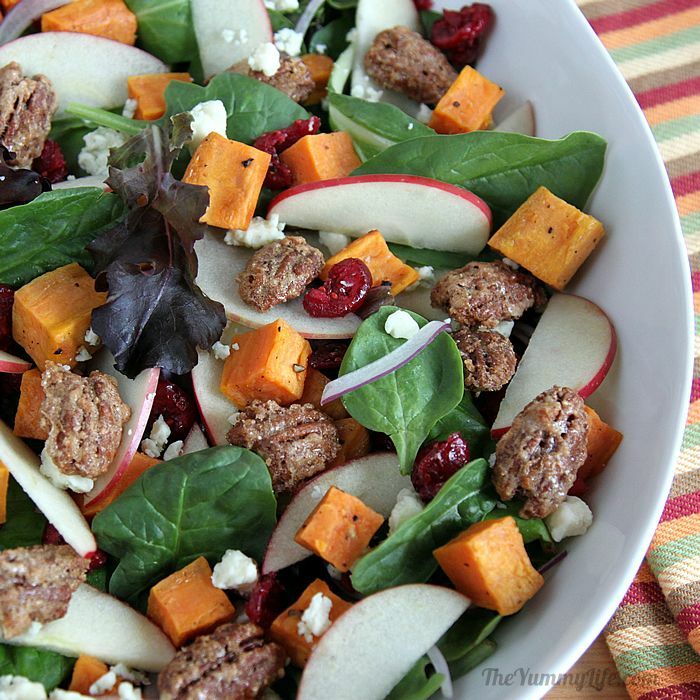 This salad combines many favorite flavors of Fall. As outside temperatures cool, meals tend to lean towards heavier, comfort-foods; and this bright, fresh salad adds balance to the table. The colorful ingredients are as beautiful as they are delicious, making it a great complement to a Thanksgiving menu. You can prep all of the ingredients ahead of time, so it's quick and easy to assemble the salad right before serving time. Feel free to omit, add, or substitute ingredients. This is an easy one to customize to suit your tastes and the ingredients you have on hand. greens--I like a 50-50 mix of baby spinach with other greens, but you can use any green or combination you like. Step 2: PEEL, CUT, ROAST THE SWEET POTATOES. Preheat oven to 450 degrees. Peel the potatoes and cut them into 1" cubes. Brush large baking sheet with 1 tablespoon olive oil. 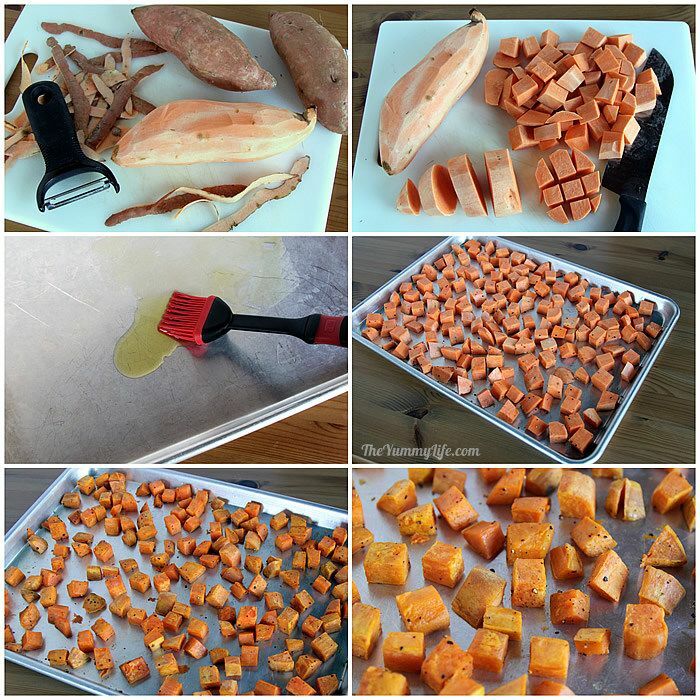 Distribute cubed sweet potatoes evenly on pan. Drizzle on remaining 1 tablespoon oil and sprinkle with salt and pepper. Toss to combine and redistribute evenly on pan. Roast 20 to 30 minutes, until slightly browned. Cool completely. Make-ahead tip: Sweet potatoes may be roasted 1-2 days ahead and refrigerated. Return to room temperature before adding them to the salad. Step 3. SLICE AND SOAK THE APPLES. For thin apple slices, first cut off 3-4 pieces from the sides of the apple, top to bottom, next to the core. Place each piece cut side down, and cut into 1/8" slices. To prevent apple slices from browning, read soaking solution options in my post: How to Prevent Apple Slices from Browning (I use a 5 minute salt water soak). This allows you to slice the apples a day ahead, if desired, and prevents the apples from browning after the salad is assembled. Step 4. 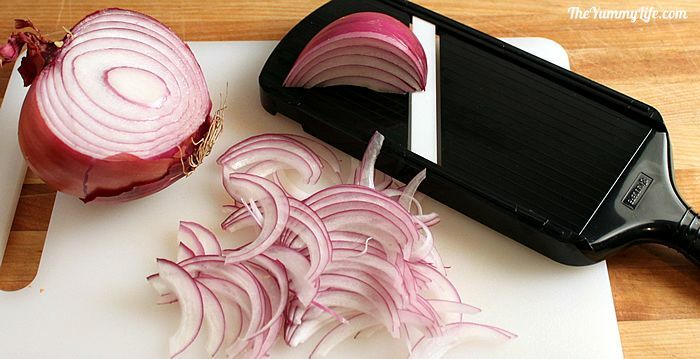 SLICE THE RED ONIONS. I like mine paper thin. A mandoline is the easiest way to accomplish that. Serving tip: Don't toss it! Do you hate it as much as I do when you toss a salad and the heavier ingredients end up in the bottom of the bowl? The result is that individual servings have an imbalance of salad ingredients. To ensure that each serving has an assortment of all of the ingredients, assemble the salad in a large shallow bowl or on a platter. Layer the ingredients with the greens on the bottom, evenly distributing the other ingredients on top of the greens. And, most importantly, don't toss the salad! Use large tongs to transfer individual portions onto salad plates, taking a section from the platter or bowl (with an assortment of all of the ingredients) for each serving. Serve dressing on the side. Or, if you prefer to have your salad tossed with the dressing so it gets more evenly coated, dress the greens only and toss them before layering on the other ingredients. Step 5. 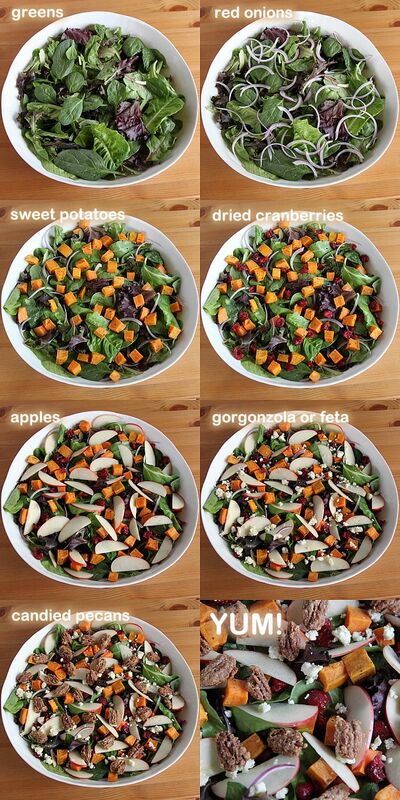 ASSEMBLE THE SALAD. Using a large shallow serving bowl or platter, layer ingredients starting with greens on the bottom. Then evenly distribute remaining ingredients over top of greens: red onions, apple slices, cranberries, cheese crumbles, and pecans. That's all there is to it! I love the combination of flavors, textures, and colors. It looks beautiful on a table or buffet. 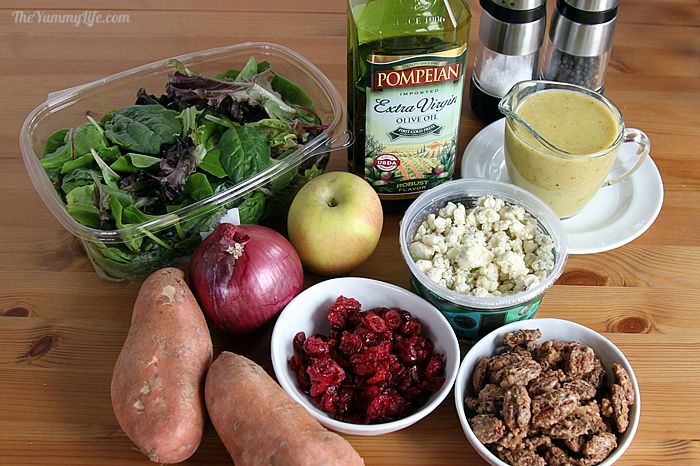 I normally dress this salad with my Apple Cider Vinaigrette. 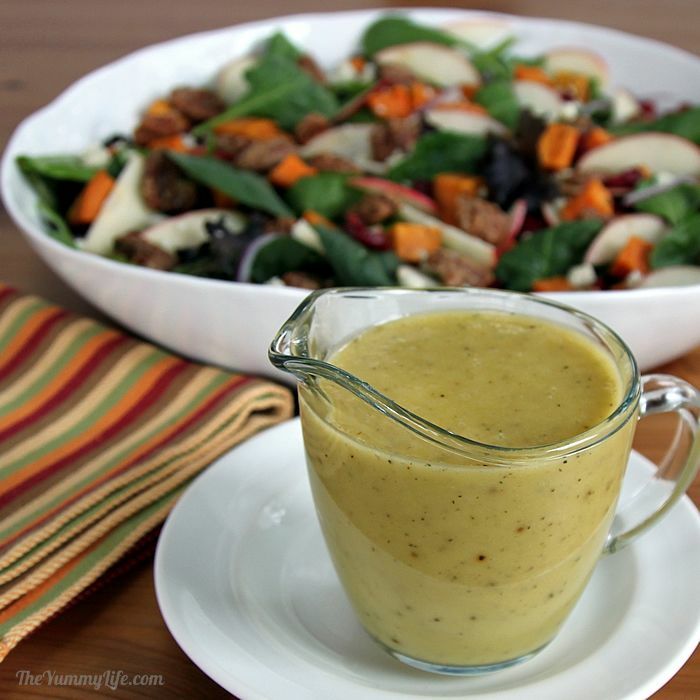 Two other favorite seasonal dressings are Cranberry Vinaigrette and Maple Walnut Vinaigrette. You can't wrong with any of these. I like to serve 2 or 3 of these on the side and let everyone dress their salad with the amount and flavor they prefer.